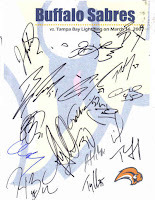 For a day when even getting a single autograph was in question, I certainly have no complaints after the Sabres' trip to Tampa. Once Mother Nature decided to clear the skies and soak us in some late afternoon sun, all it took was a little patience to, once again, significantly add to the collection. In addition to Colin's team sheet (shown at left), including autographs from Daniel Briere, Brian Campbell, Chris Drury, Jason Pominville and Ryan Miller among the 16 upon it, we also added pucks signed by Ty Conklin, Jochen Hecht, Dmitri Kalinin, Teppo Numminen, Andrew Peters, Derek Roy, Mike Ryan and Drew Stafford. I was surprised, too, by the turnout. The crowd of somewhat-clueless Sabres fans (Way too many 'Who's that?' from people adorned in Sabres gear) seeking autographs easily outnumbered the usual suspects. Even inside the St. Pete Times Forum, quite a few folks made the trip from western New York to take in the game. Several times during the Sabres' 3-2 win, Lightning fans were outchanted by Buffalo's faithful.